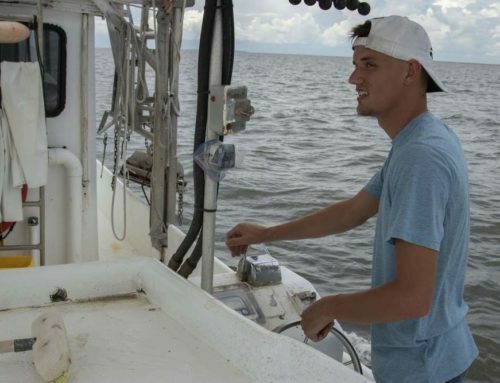 The dead zone that has formed in the Gulf of Mexico this summer is smaller than predicted, but is still larger than average, spanning an area roughly the size of Connecticut. This zone, an area without oxygen and almost completely devoid of life that crops up every summer, covers 5,840 square miles (15,125 square kilometers), according to the National Oceanic and Atmospheric Administration (NOAA). 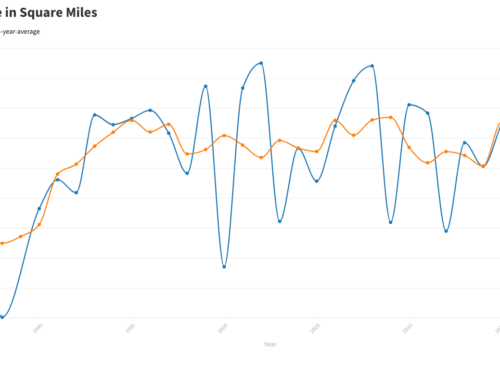 In June, NOAA predicted the dead zone would be at least 20 percent larger this summer, expecting it to take up at least 7,286 square miles (18,871 square km). 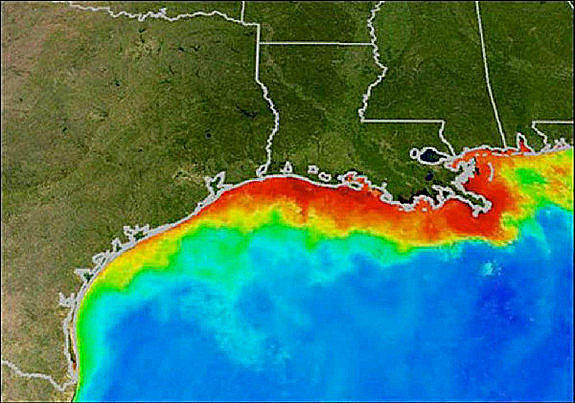 Dead zones are the indirect result of nutrients, largely from fertilizer use, running off into rivers and then into bodies of water like the Gulf. Once these excess nutrients reach the ocean, they fuel algae blooms. The algae then die and decompose in a process that consumes oxygen and creates oxygen-free areas where fish and other aquatic creatures can’t survive. 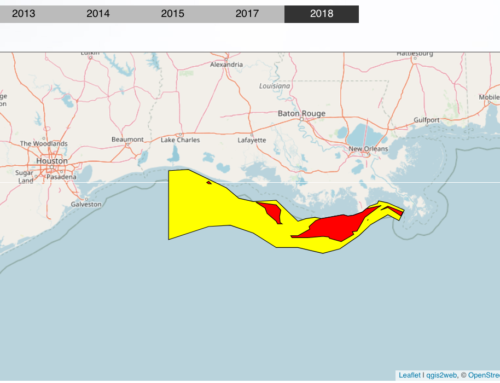 This zone can have serious impacts on commercial and recreational fisheries on the Gulf Coast, causing fish die-offs. 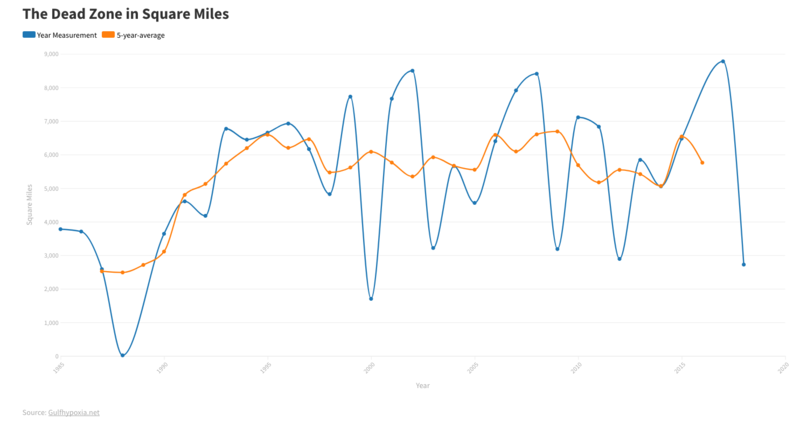 But the dead zone this summer, the time of year when the phenomenon occurs, is larger than average: Over the past five years, the average dead zone has covered 5,176 square miles (13,405 km), according to NOAA. 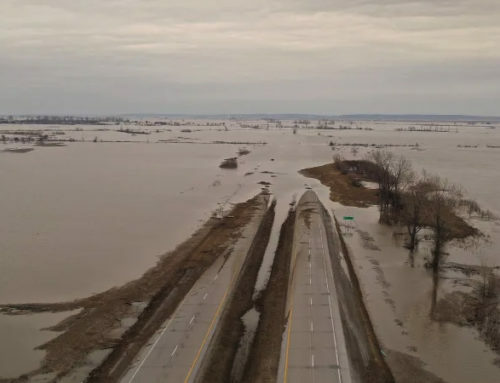 That’s more than twice the 1,900-square- mile (4,921 square km) goal set by the Gulf of Mexico / Mississippi River Watershed Nutrient Task Force, a group that seeks to reduce the size of this lifeless area, according to NOAA. 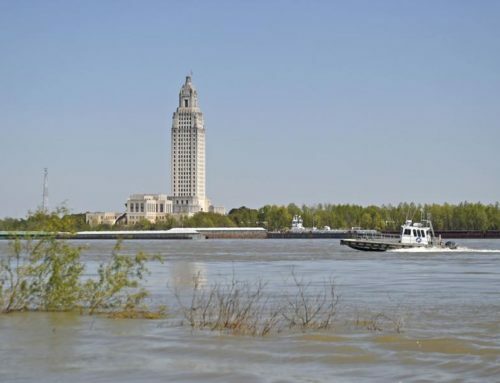 Last summer, the dead zone in the Gulf was the fourth smallest on record, thanks to a drought that gripped much of the central United States; less rainfall means less nutrient runoff. 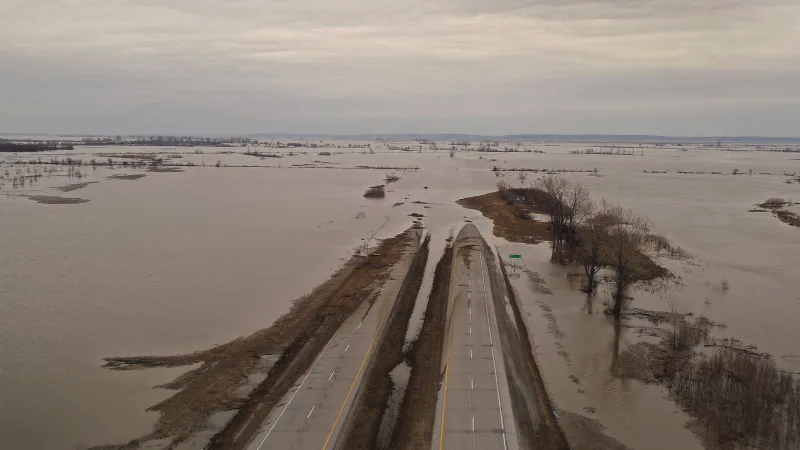 That dead zone measured 2,889 square miles (7,482 square km), an area slightly larger than Delaware, NOAA reported. 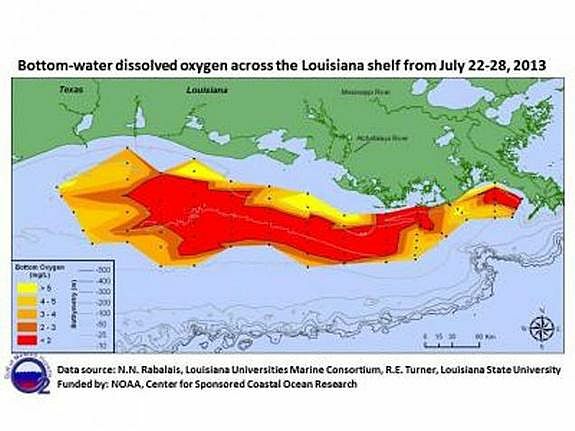 The biggest dead zone on record came in 2002, when it reached 8,481 square miles (21,965 square km). 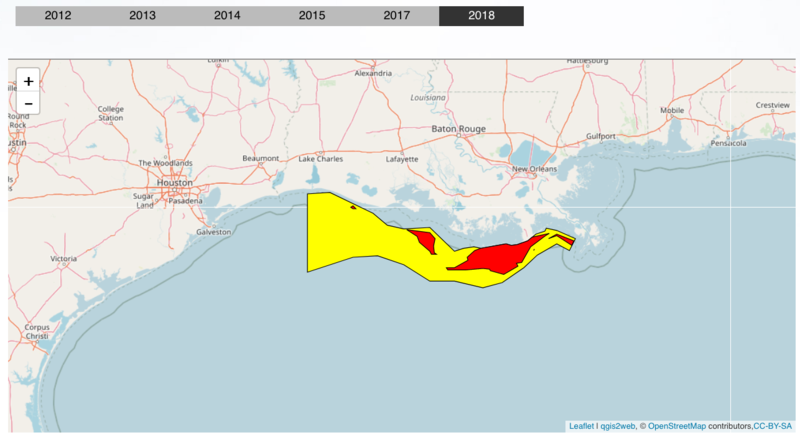 This year’s dead zone is smaller than predicted due in part to strong winds over the Gulf, which mixed oxygen into deeper waters, according to NOAA. 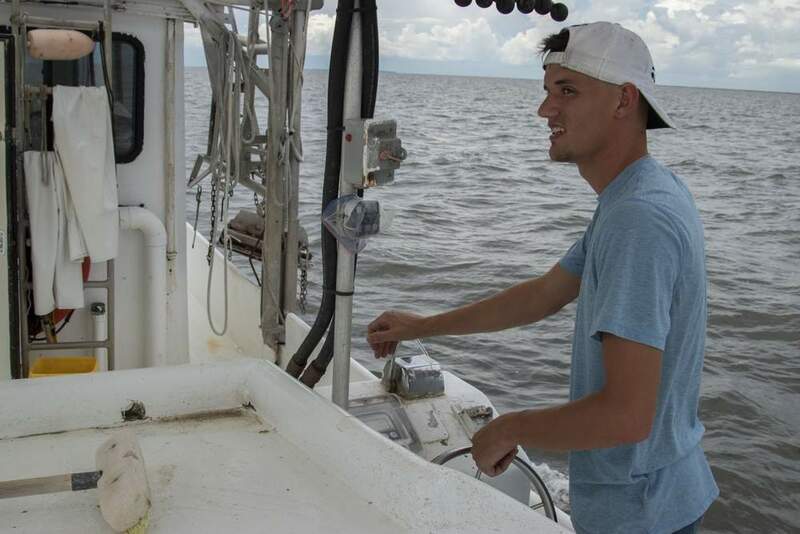 The zone was mapped during a research cruise from July 21-28 and led by the Louisiana Universities Marine Consortium. A final survey will take place in mid-August.